Microbiologists led by Derek Lovley at the University of Massachusetts Amherst, who is internationally known for having discovered electrically conducting microfilaments or "nanowires" in the bacterium Geobacter, announce in a new paper this month that they have discovered the unexpected structures in many other species, greatly broadening the research field on electrically conducting filaments. Details appear online in the International Society of Microbial Ecology Journal. Lovley, who published his first paper describing Geobacter 30 years ago, explains, "Geobacter have evolved these special filaments with a very short basic subunit called a pilin that assemble to form long chains that resemble a twisted rope. Most bacteria have a basic subunit that is two to three times longer. Having electrically conducting pili or e-pili is a recent evolutionary event in Geobacter, so the working hypothesis was that this ability would only be found in its close relatives." He adds, "It was surprising to us, and I think many people will be surprised to learn, that the concept that microbes need the short pilin subunit to produce e-pili is wrong. We have found that some much larger pilins can also yield e-pili and that the ability to express e-pili has arisen independently multiple times in the evolution of diverse microbial groups." He and co-authors add that "e-pili can have an important role in the biogeochemical cycling of carbon and metals and have potential applications as 'green' electronic materials." Lovley says, "This is a great development, because now the field will widen. 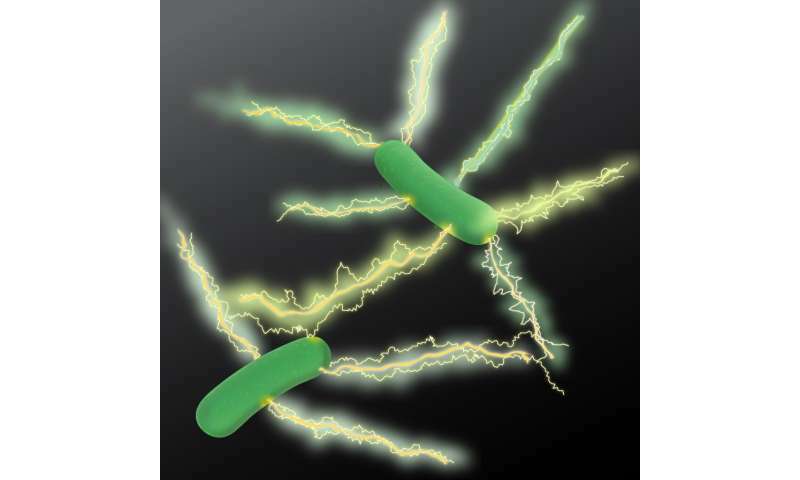 Microbiologists now know that they can work with other microbes to investigate electrically conductive filaments. We've found a broad range of microbes that have this. One interesting thing we already can report is that some of the new bacteria we've identified have filaments up to 10 nanometers in diameter. Geobacter's filament are very thin, just three nanometers in diameter. For building electronic devices like nanowire sensors, it is a lot easier to manipulate fatter wires. It will also be more straightforward to elucidate the structural features that confer conductivity with the thicker wires because it is easier to solve their structure." He hopes the discovery of additional electrically conducting protein nanowires will contribute to a much-needed "green," sustainable revolution in electronics manufacturing. "Our current system of using considerable energy and rare resources to produce electronics, then throwing them away in toxic waste dumps overseas, is not sustainable," Lovley says. Producing electronic biological materials with microbes can be achieved without harsh chemicals and requires lower energy inputs, he points out. "And the microbes eat cheaply. In the case of Geobacter, we basically feed them vinegar." Lovley and colleagues report that "strains of G. sulfurreducens producing high current densities, which are only possible with e-pili, were obtained with pilin genes from Flexistipes sinusarabici, Calditerrivibrio nitroreducens and Desulfurivibrio alkaliphilus. The conductance of pili from these strains was comparable to native G. sulfurreducens e-pili." In recent years, the UMass Amherst microbiologists and physicists working with Geobacter species developed a hypothesis for how its e-pili are able to conduct electric current based on the presence of aromatic amino acids in the pilin subunits. They have used this characteristic - a high density of aromatic amino acids and a lack of substantial aromatic-free gaps along pilin chains - to select candidate pili genes from other microorganisms, including many difficult-to-culture microorganisms. Using this technique "reveals new sources for biologically based electronic materials and suggests that a wide phylogenetic diversity of microorganisms may use e-pili for extracellular electron exchange," they report. To test and validate their biological screening results, they took native pilin genes out of Geobacter and replaced them with Calditerrivibrio genes, for example, then placed this genetically modified organism into a microbial fuel cell to see if it would produce electric current. In several cases, they did, Lovley says. Lovley discovered Geobacter when he was hired by the U.S. Geological Survey to conduct its first microbiology project in water quality in the Potomac River, in particular to understand which microbes were influencing algal blooms fed by phosphates in river sediments. He recalls, "Most scientists, including microbiologists, thought that a chemical reaction was responsible for the iron transformations in the mud that released associated phosphates as pollution into the water. However, when we looked into this further, it was clear that microorganisms were involved and that led us to the discovery of Geobacter." Over the years, other unique features of Geobacter have resulted in many "microbiology firsts" in the fields of biogeochemistry, bioremediation and renewable energy. Lovley says, "Now Geobacter has drawn us into electronics. I am excited to find out if these new electrically conductive protein nanowires from other bacteria might function even better than the Geobacter wires for applications such as biomedical sensors. The simple screening method described in our paper is identifying genes for conductive wires in diverse microorganisms that may rely on electrical signaling for unique functions of biomedical and environmental significance."